If your pet needs an x-ray, our digital veterinary x-rays use radiography equipment that allows us get accurate results quickly. The improved image quality helps us make a more accurate diagnosis. Conventional radiographic cassettes required the developing of x-ray films, but these cassettes have now been replaced by a digital imaging sensor. This allows our staff to take a digital veterinary x-ray that immediately appears on a computer screen. We can give you faster answers and begin treating your pet without delay. 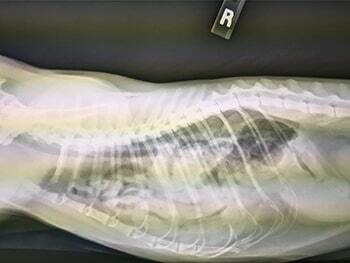 Digital radiography is also safer for your pet and for our staff. It uses less radiation and does not involve any harmful developing chemicals. We also use digital dental x-rays for all of our dental patients. Digital veterinary x-rays give us extremely clear dental images to better diagnose your pet’s dental health.